For the American Orthodox Jewish congregation and synagogue, see Baron Hirsch Synagogue. Moritz (Zvi) von Hirsch, also known as Maurice de Hirsch (German: Moritz Freiherr von Hirsch auf Gereuth; French: Maurice, baron de Hirsch de Gereuth; 9 December 1831 – 21 April 1896), was a German Jewish financier and philanthropist who set up charitable foundations to promote Jewish education and improve the lot of oppressed European Jewry. He was the founder of the Jewish Colonization Association, which sponsored large-scale Jewish immigration to Argentina. Hirsch was born on 9 December 1831 in Munich. His parents were Baron Joseph von Hirsch auf Gereuth [de] and Caroline Wertheimer. His grandfather, the first Jewish landowner in Bavaria, was ennobled in 1818 with the appellation auf Gereuth. His father, who was banker to the Bavarian king, was made a Freiherr in 1869. For generations, the family occupied a prominent position in the German Jewish community. At the age of thirteen, Hirsch was sent to Brussels for schooling. He then went into business, at the age of seventeen. On 28 June 1855, Hirsch married Clara Bischoffsheim, daughter of Jonathan-Raphaël Bischoffsheim of Brussels. They had a daughter who died in infancy and a son, Lucien (1856–1887), who predeceased his parents. Hirsch died at Ógyalla in Hungary (now part of Slovakia) on 21 April 1896. His wife seconded her husband's charitable work with great munificence — their total benefactions have been estimated at £18,000,000. She died in Paris on 1 April 1899, leaving the remaining family assets to her adopted son, Maurice Arnold de Forest (later titled Count of Bendern). 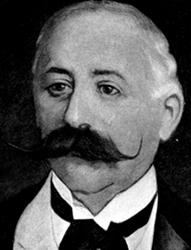 Hirsch was amongst the top five richest individuals in Europe at the time. In 1855, Hirsch became associated with the banking house of Bischoffsheim & Goldschmidt, of Brussels, London and Paris. He amassed a large fortune, which he increased by purchasing and working railway concessions in Austria, Turkey and the Balkans, and by speculations in sugar and copper. His best known railway venture was the Chemins de fer Orientaux, a visionary railway project intended to link Vienna to Istanbul. Hirsch lived in Paris, where he owned a townhouse on rue de l'Elysée and the Château de Beauregard. He also had residences in London, Hungary, and in what is now the Czech Republic (Veveří, Rosice). Hirsch devoted much of his time to schemes for the relief of Jews in lands where they were persecuted and oppressed. He took a deep interest in the educational work of the Alliance Israelite Universelle, and on two occasions presented the society with gifts of a million francs. For some years, he regularly paid the deficits in the accounts of the Alliance, amounting to several thousand pounds a year. In 1889, he capitalized his donations and presented the society with securities producing an annual income of £16,000. Hirsch donated £1000 to The Chelsea and Westminster Hospital in 1891. On the occasion of the fortieth anniversary of Emperor Francis Joseph's accession to the Austrian throne, he gave £500,000 for the establishment of primary and technical schools in Galicia and the Bukowina. Hirsch donated to charity all the prize money won by his string of racehorses, including more than £35,000 won by his mare La Fleche between 1891 and 1894. The greatest charitable enterprise on which Hirsch embarked was in connection with the persecution of the Jews in Russia. He gave £10,000 to the funds raised for the repatriation of the refugees in 1882, but, feeling that this was a very lame conclusion to the efforts made in western Europe for the relief of the Russian Jews, he offered the Russian Government £2,000,000 for the endowment of a system of secular education to be established in the Jewish Pale of Settlement. The Russian Government was willing to accept the money, but declined to allow any foreigner to be concerned in its control or administration. Thereupon, Hirsch resolved to devote the money to an emigration and colonization scheme which should afford the persecuted Jews opportunities of establishing themselves in agricultural colonies outside Russia. He founded the Jewish Colonization Association as an English society, with a capital of £2,000,000, and in 1892 he presented to it a further sum of £7,000,000. On the death of his wife in 1899, the capital was increased to £11,000,000, of which £1,250,000 went to the Treasury, after some litigation, in death duties. This enormous fund, which was in its time probably the greatest charitable trust in the world, was managed by delegates of certain Jewish societies, chiefly the Anglo-Jewish Association of London and the Alliance Israelite Universelle of Paris, among whom the shares in the association have been divided. The association, which was prohibited from working for profit, possessed large agricultural colonies in Argentina, Canada and Palestine. In addition to its vast agricultural work, it had a gigantic and complex machinery for dealing with the whole problem of Jewish persecution, including emigration and distributing agencies, technical schools, co-operative factories, savings and loan banks, and model dwellings. It also assisted a large number of societies all over the world whose work was connected with the relief and rehabilitation of Jewish refugees. Besides this great organization, Hirsch founded in 1881 a benevolent trust in the United States for the benefit of Jewish immigrants, which he endowed with £493,000. His minor charities were on a princely scale, and during his residence in London, he distributed over £100,000 among the local hospitals. In 1900, his estate donated funds to the Pasteur Institute in Paris for the construction of their chimie biologique (biochemistry) building. The Beth Israel Synagogue (Halifax, Nova Scotia) originally was known as the "Baron de Hirsch Benevolent Society". There is also a Baron Hirsch Synagogue in Memphis, Tennessee and Temple De Hirsch Sinai in Seattle and Bellevue, Washington. Baron Hirsch Cemetery on Staten Island, New York is also named for him. Hirsch is honoured also with naming a commercial stoa, a street and a district at the center of Thessaloniki, Greece. ^ Téc Britch, Juan José (n.d.). "Brief history of Basavilbaso". Municipality of Basavilbaso. Archived from the original on 24 June 2016. Retrieved 18 May 2016. ^ "Papers Past — Otago Witness — 8 December 1892 — RACING IN ENGLAND". Paperspast.natlib.govt.nz. Retrieved 2011-12-01. ^ Jewish Settlement in Rural Argentina. ^ "History – Temple De Hirsch Sinai". templedehirschsinai.org. Retrieved 2018-10-03. Friedenberg, Albert M. (1932). "Two German Jewish Families". Jewish Quarterly Review. New Series. 23 (2): 205–207. JSTOR 1451957. Kasper-Holtkotte, Cilli (2003). Im Westen Neues: Migration und ihre Folgen : Deutsche Juden als Pioniere jüdischen Lebens in Belgien, 18./19. Jahrhundert. Brill. pp. 183–184. ISBN 9004131094. Wikimedia Commons has media related to Maurice de Hirsch. "Hirsch, Maurice" . New International Encyclopedia. 1905. This page was last edited on 18 February 2019, at 04:47 (UTC).